Your looking for a past event in the ios calendar app but can’t find it. Once you’ve ascertained the correct date you realize you couldn’t find it because it’s not there! 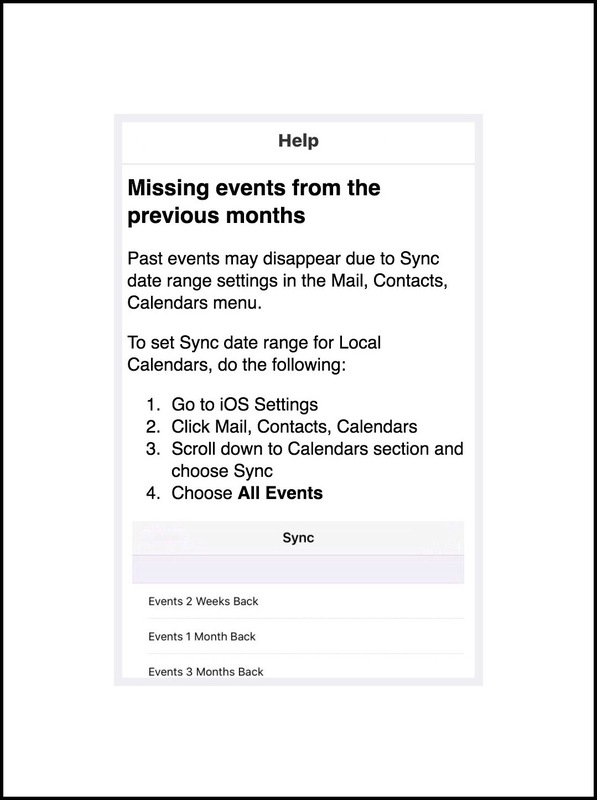 Assuming that you aren’t experiencing more significant problems with the calendar app in which random events keep disappearing from future events too…there’s may be a simple and quick fix. If you are having the bigger problem with all calendar events…most likely you are syncing ios calendars with other calendars such as Google or Hotmail. If that is the case turn off the syncing and see if that resolves the problem…it did for me and the culprit was Google calendars. Once you’ve ascertained when the event should have been you may attempt to add it back into your calendar if, like me, you rely on your digital calendar as a record of past events too. While attempting to add this past event back into the calendar (regardless of whether or not it was in there originally) it looks like it’s working and then you watch as the calendar app just removes it again a few seconds after you added it. No matter how many times you try this you just can’t get the past event to stick and stay visible in your calendar. Go to Settings – Mail, Contacts, Calendars…and scroll down the page to get to the Calendar section. Following several failed Google searches I decided to downloaded a Calendar app I’d used in the past when I have problems with the ios calendar app. The one I like is called Calendar 5 by Readdle (it’s $6.99) Readdle is an app devloper who has developed an entire suite of office and productivity apps that are solid. Many of them are free too. This entry was posted in ios 9, ios 9 Quick Tips, ios apps and tagged fix ios disappearing events, ios 9 calendar tips, ios calendar problem. Bookmark the permalink.